The last great wilderness areas in warm climes are in Africa. Most of these areas have only been dramatically effected by man in the last 100 years. As a result we are lucky today to be able to see an astounding number of animals while on safari. Some species do well in a wide variety of habitats, or in environments that are widespread and common throughout Africa. Some of the predators fit this category, such as lions and spotted hyenas. Wildebeest (blue) and plains zebra (Burchell’s) are found almost wherever there is grassland. The magnificent greater kudu occurs where there is thick bush or arid stony terrain from Kenya and Ethiopia south as far as S outh Africa and even Namibia, although it is hardly a common species (except in some parts of South Africa, Zimbabwe or Zambia). However there are lots of other species that are more specialized, being limited by habitat, or having a much tougher time competing with others. The only place anyone is likely to see a slaty egret are the swamps of the Okavango Delta in Botswana. Mountain gorillas can only be found in a corner of Uganda, Rwanda and the Congo. The gerenuk (antelope) is found in arid areas from a tiny corner of north-eastern Tanzania north into the arid areas of Kenya, Ethiopia and Somalia. We were in Ruaha national park, a huge remote national park in central Tanzania. Ruaha is 20,220 km2 ( 7,800m2) or about the size of the state of New Jersey. One special species found there is the lesser kudu. Lesser kudu occur in a swathe of land characterized by dry thicket from Ethiopia and Somalia southwards through the arid parts of Kenya and northern Tanzania. Lesser kudu need thick vegetation, and are inherently very shy. If you are ever lucky enough to see one, you may only see the white undertail, as it escapes into another mass of bush. There were a few places I used to see lesser kudu regularly years ago, but the increase in human population is usuall y coupled with livestock. Goats have opened up many bush habitats, modifying them, changing them into more open habitats, which in turn are over-grazed by sheep, limiting land available to the lesser kudu. 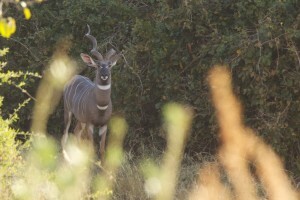 These days when I see a lesser kudu, a smile engulfs me. I feel relieved that they are still there, surviving, and feel immensely lucky to have seen them. 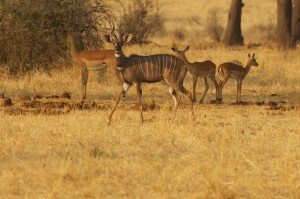 Years ago I used to get a glimpse of a lesser kudu quite often near the place we used to camp in Ruaha. Then there was a period where sightings became less frequent. I am not sure why this is, but it is possible that the bush opened up in many areas after the CITES ban on trading elephant products, and the fall in poaching that ocurred in the 80s and 90s. An increase in elephant population will open up the bush, modifying it, and creating habitats less conducive to the lesser kudu. 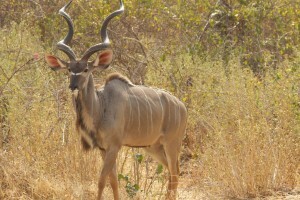 Anyway I was delighted to have fantastic views of lesser kudu on a daily basis near camp the last time I was in Ruaha. It almost felt as if they were common. A couple of times they did not flee but kept an eye on us, so we were able to really see them and get some great photos. What a treat! NOTES ON KUDUS Kudus are medium or large-sized antelope with enormous ears, and a brown to grey coat with distinctive white perpendicular stripes down the sides of the back. Males have wonderful spiral horns. The females do not have horns. The greater kudu is the tallest antelope after the eland, reaching a height of about 1.35m. An adult male weighs about 240kg, and a female about 170kg. 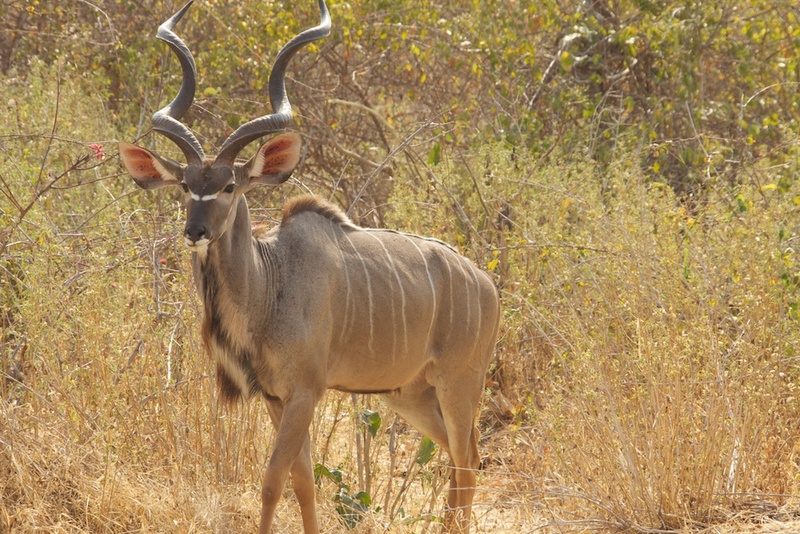 The greater kudu male’s long spiral horns are largest horns of any antelope, being up to 1.8m along the outer curve. Greater kudu have a narrow white stripe along the ridge of the back and about 6-10 prominent perpendicular stripes down the sides of the back, a distinctive white nose chevron, and no throat or chest patches. Both sexes have a dorsal crest (like a short mane along the back), and the buck has a distinctive beard. The male lesser kudu also has wonderful twisted horns, is generally dark in color, about 1m tall and weighs from 90-110kg. Like its much larger cousin, the female is a russet brown, but weighs less than half – about 55-70kg. Lesser kudus have a large distinct white throat patch, and a white patch on the chest. They have 11-15 white stripes along the back, and only the male has a dorsal crest.